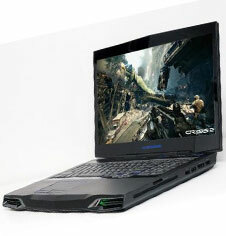 I just successfully installed the eurocom Nvidia GTX880M kit to replace (and upgrade) the GPU on my Alienware M17x R3. This was my "last straw" on a constantly crashing laptop after Dell support first made me change my hard disk and then gave up, saying it did not recommend changing the card and that there were no upgrades or replacement cards available. 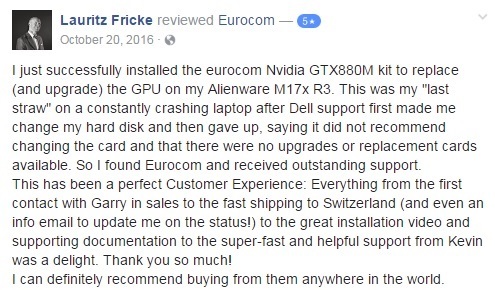 So I found Eurocom and received outstanding support. This has been a perfect Customer Experience: Everything from the first contact with Garry in sales to the fast shipping to Switzerland (and even an info email to update me on the status!) to the great installation video and supporting documentation to the super-fast and helpful support from Kevin was a delight. Thank you so much! I can definitely recommend buying from them anywhere in the world.